Oh, nerra! Star Wars Rebels Character Names & The Legacy of Cham Syndulla! The main cast of Star Wars Rebels has been dripping out in drops here and there as of late. Our buddy 12MG12 alerted us to some infor from EuroBricks.com Apparently there is a Lego set coming out soon that contains many of the characters from the new series, giving us the last names of characters we had only heard the first names of so far. We know that Zeb will pilot The Phantom. In the very low rez Lego shot we have seen, Zeb appears to be a red headed girl to me, but it could be a hood, but I’m betting on red hair at this moment. She also comes with a blue astromech droid which could be Artoo-Detoo or a new droid. It appears Ezra Bridger is the pilot of The Ghost and he rocks a cadet helmet of some sort. The Ghost seems to have two cockpits and can be controlled by the main cockpit that Ezra pilots from. But if something should happen, Zeb seems to be able to pilot The Ghost via The Phantom when attached to the mainship. Also remember, there have been tons of rumors that a character from this show goes on to be in Star Wars: Episode VII, so you might have just read an Episode VII character name, or not. Hera Syndulla is a very interesting name. 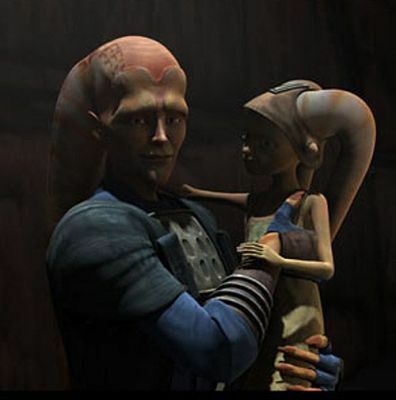 You might remember Cham Syndulla from Season 1 of the Star Wars: The Clone Wars. Cham takes on the Confederacy of Independent Systems on Ryloth. The girl in the picture is Numa. Interestingly, Numa and Hera Syndulla are probably about the same age. Is there some relation? It seems that’s probably the case. So we might have a solid connection to The Clone Wars right there.